Every now and then it is important to take a step back and look at things in some perspective, to look at the world deeply and appreciate how things really are. In that spirit, we at Earth Mantra are going to take a moment and do exactly that. What are we blathering on about? Well, to put it simply, we are completely in awe of this release we now have the pleasure to bring to you. And, so, let's put it into some perspective. Firstly, this is one of the most profound ambient recordings we have ever heard, by anyone, at any time, any where. This is majestic, uplifting, mind altering, exquisite, fascinating contemplative music that stands tall amongst the greatest ambient recordings ever made. Secondly, it is by one of the top ambient artists of all time, one of the true grand masters of the genre, who has been making deep thoughtful ambient music as long as the 'ambient' moniker has existed, and can truthfully claim to have altered the course of the genre itself. Finally, it is our favorite release by this artist, which is a truly remarkable thing to say given our extreme admiration for all of this man's other work, both as a solo artist and in collaboration. 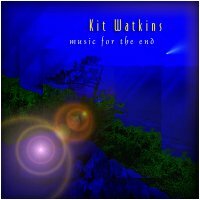 And this masterwork, this album entitled Music For The End by none other than legendary artist Kit Watkins, is being brought to you via our own humble little netlabel, Earth Mantra. This is what we mean by perspective, folks. We don't know how we came to be so fortunate as to be able to release an album of this magnitude and stature, but here we are doing exactly that. It is an honor of the highest order to be able to release this immaculate album on Earth Mantra, and we could not be more grateful to Kit that he has chosen to make so much of his extensive catalog of music available to the world via Creative Commons. Thank you Kit, for your music, and for your generosity. Thank you very much for this great music. The quality and warmth of this album is stunning. The fact that it's free is divine. Thanks for sharing such beauty with the electronic community, Mr. Watkins. absolutely breathtaking,. ive loved this album ever since it was released on mp3.com 'back in the day' great to hear it unedited and in better sound quality. i believe this recording was performed live as part of The Gatherings performance. can anyone confirm this?